The post Prebiotics for Dogs — A Dog Parent’s Primer by Jennifer Lesser appeared first on Dogster. Copying over entire articles infringes on copyright laws. You may not be aware of it, but all of these articles were assigned, contracted and paid for, so they aren’t considered public domain. However, we appreciate that you like the article and would love it if you continued sharing just the first paragraph of an article, then linking out to the rest of the piece on Dogster.com. It’s now well known that probiotics are friendly forms of bacteria that live in the intestines and can improve our health in several ways — and now, they’re not just for humans. Many veterinarians recommend probiotics for dogs for everything from treating digestive conditions to boosting the immune system. But in order to fully reap the benefits of probiotics for dogs, experts say prebiotics for dogs may be equally important. What are prebiotics for dogs and how are they beneficial to your pup? Photography ©UserGI15966731 | Getty Images. Dr. Brienen uses gut supportive therapy regularly in her practice to promote overall health, particularly in young dogs and cats, and even to treat allergic or autoimmune disease and digestive disease. “When the intestines are leaky, proteins that wouldn’t normally move through the intestinal wall can get through … and the body sees these as foreign invaders,” she explains, noting that a dog’s body will naturally create antibodies to fight off these proteins, which can lead to skin, eye, ear, digestive and neurologic problems. “If you heal the leaky gut, you can solve these problems … which is why prebiotics (and probiotics) can be helpful for the immune system and support health in all systems of the body,” she adds. What Foods Can Act as Prebiotics for Dogs? Dr. Brienen notes that many fiber-rich foods can act as prebiotics for dogs. One of the first ones she uses in her practice is pumpkin or pumpkin powder, and she also recommends cooked yams as a fiber-rich source of prebiotics for dogs. “Pumpkin helps with intestinal health, whether the dog is dealing with diarrhea or constipation,” she explains. “Fiber slows down the intestinal transit time, absorbs fluid, lowers the pH and provides nutrients for beneficial bacterial.” Better yet, prebiotics aren’t as fragile as probiotics, in that they are not sensitive to temperature, pH or gut transit time, she notes. The good news is that prebiotics for dogs may already be part of your canine’s daily routine. Because prebiotics are fibers and it’s relatively easy to introduce them into your dog’s diet — think ingredients like raw oats and flaxseed — it’s no surprise that they have actually been used in pet foods for decades. “Prebiotics and probiotics are included in most commercial foods, so in one way or the other, your dog is probably getting the benefits … as long as you’re feeding him a high-quality diet,” explains Dr. Charles Loops, a homeopathic veterinarian in North Carolina. However, Dr. Loops warns that pet parents who are preparing a diet for their dogs at home should be especially diligent about incorporating probiotics and prebiotics for dogs. 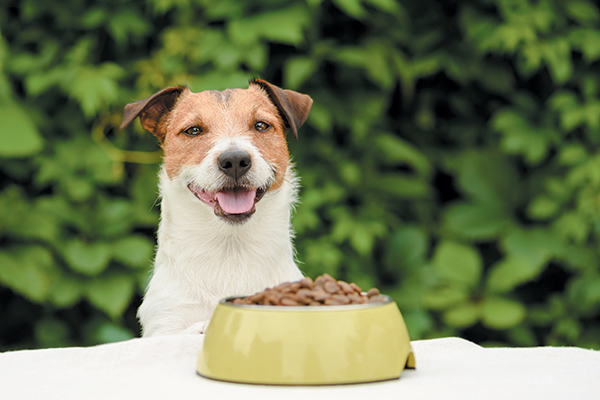 In some cases, dogs that are eating a dry commercial dog food can also benefit. “If you’re preparing your pet’s diet, prebiotics and probiotics become more of a consideration … and if your dog is on a single dry food and that’s all you ever feed them, you also may want to consider incorporating prebiotics and probiotics,” Dr. Loops advises. Dr. Brienen recommends prebiotics for dogs, such as FOS (fructo-oligosaccharide), prebiotic products such as Animal Essentials Healthy Gut (which contains chicory, marshmallow and yucca root, and fennel seed), ground flaxseeds and resistant starch. “Resistant starch is a beneficial prebiotic — it feeds the friendly bacteria in your colon, and turns them into important short-chain fatty acids,” she explains. It’s also important for pet owners to know that the usage of probiotics and prebiotics for dogs is not well regulated, so label descriptions may not accurately reflect the contents of the bottles — and potential risks or side effects may be difficult to predict. “To help avoid this, it’s always recommended to follow your veterinarian’s advice on which supplements to utilize,” Dr. Morrison concludes.